MINNEAPOLIS & REHOVOT, Israel — (BUSINESS WIRE) — September 17, 2014 — Stratasys Ltd. (Nasdaq: SSYS), a global leader of 3D printing and additive manufacturing solutions, announced today its partnership with FirstBuild, a GE affiliate. The partnership combines co-creation and micro-manufacturing to build and commercialize the next evolution of various GE appliances and accessories by leveraging 3D printing, and other advanced manufacturing processes in an open innovation approach to engineering. GE Appliances, a subsidiary of General Electric Company (NYSE: GE) in collaboration with Local Motors, established FirstBuild, a new model for the appliance industry aimed to allow concepts to rapidly reach the marketplace. Individuals design and submit ideas, and a community of home enthusiasts, designers, engineers, and makers tests out the ideas and creates the products with the help of Stratasys 3D printing technology. FirstBuild will then manufacture and deliver the next generation of major home appliances to customers. 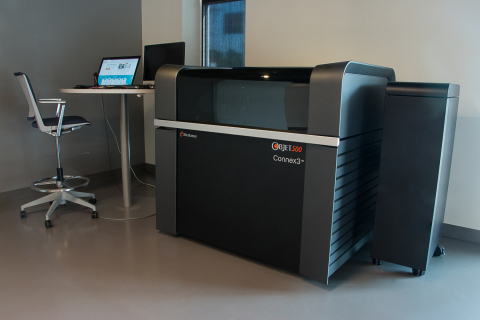 Stratasys 3D Printers will go to work in the FirstBuild micro-factory located in Louisville, Kentucky, which is where ideas may come to grow into real products. 3D printing along with woodworking, welding, and other tools will be used to test and build the initial products. The micro-factory will produce products and sell them through FirstBuild’s website and retail store located at the micro-factory, and through traditional retail channels. “Incorporating Stratasys’ leading additive manufacturing technology into our micro-factory capabilities provides an enormous benefit in both product development and production by saving us time, money and resources,” said Natarajan “Venkat” Venkatakrishnan, Director of FirstBuild and Director of Advanced Technologies for GE Appliances. “It will also give the University of Louisville engineering students and others who work on this equipment at FirstBuild a significant advantage as they pursue jobs in technical fields.” Watch Venkat discuss the 3D printing systems that FirstBuild uses in its goal to rapidly produce a new generation of home appliances. FirstBuild, a partnership between GE and Local Motors, the open-source hardware innovator, harnesses the expertise and creativity of an online and offline global community that is dedicated to conceiving, engineering and building the next generation of major home appliances. It enables engineers, designers, scientists and home enthusiasts to participate in the development of breakthrough appliances and solve deep engineering challenges. Participants will identify market needs, directly participate in the product development and watch via social media as ideas speed from mind to market at the FirstBuild Microfactory in Louisville, Ky. To learn more about FirstBuild, visit: http://www.FirstBuild.com/. FDM, Stratasys and Objet are registered trademarks, and Fused Deposition Modeling and PolyJet are trademarks of Stratasys Ltd. and or its subsidiaries or affiliates. Stratasys Included in New TV Series "Titan American Built"